James Harris, a student on the Horology BA degree course at Birmingham City University, has launched Harris Horology, a website to showcase his watch plans (the Hilhouse) and his dissertation piece (a table clock – the Woodes). I think I first stumbled across James on Instagram, although it may have been on Twitter. Or perhaps his name was mentioned by Rebeca or Craig Struthers, who have close links to the School of Jewellery in Birmingham. As well as his watch and clock, James has started making jewellery for #watchnerds (and anyone else who appreciates beautifully-made objects). 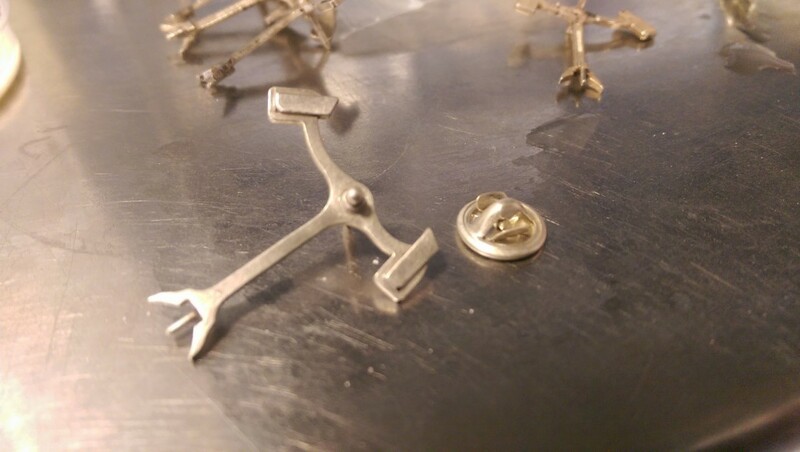 Specifically, he has designed and produced a hand-made solid sterling silver lapel pin, based on the lever and pallets commonly found in a swiss inline escapement. Intrigued, I ordered one, and set about finding out more about its making. 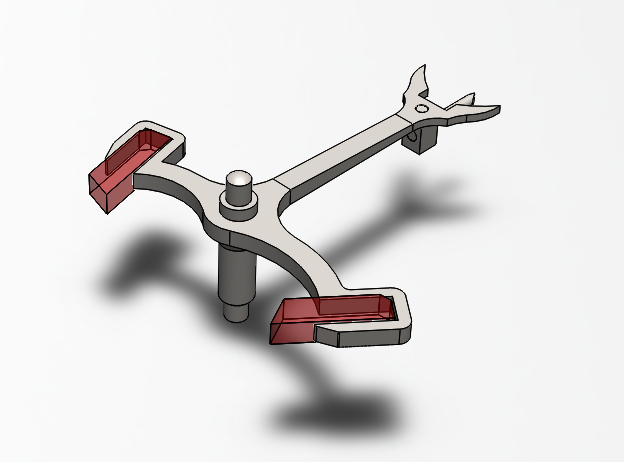 James uses a combination of old and new techniques to make these pins: using CAD skills gained from his Horology studies**, he drew a club-toothed lever that could be used as a template. 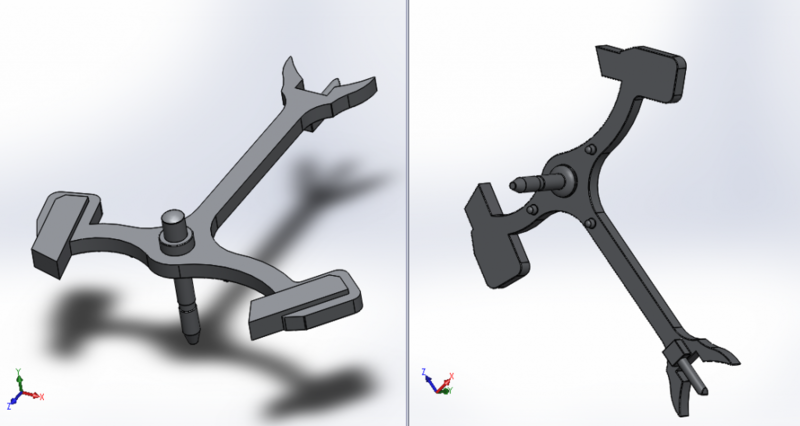 He scales it up by approximately 4 times to make it wearable on the lapel, while also removing the bottom pivot and arbor to replace it with a pin back (see renders above). At this point I could have used laser sintering*** to make the model straight into silver, but in my opinion, the quality of the finish isn’t high enough, and so I opted to combine new and old; getting a very high resolution plastic print, which could then be moulded and copied using the lost wax method. This print method is the reason the back of the pins have a sort of ‘wood grain’ effect. James also believes that he gets a much higher level of detail using this method than if they were laser sintered, but unfortunately it means that each piece needs to be cleaned up by hand, removing mould lines, and creating the shape of the pallet jewels. 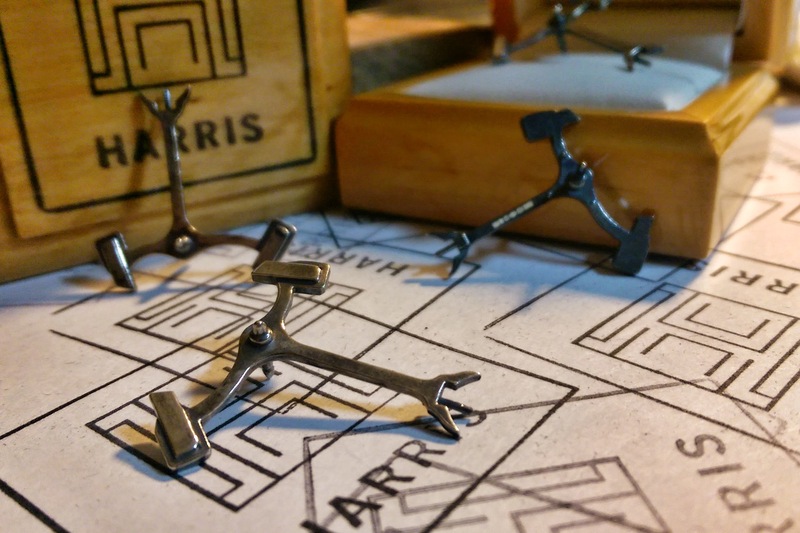 Casting in silver requires sprues, and unfortunately the only suitable place to put those was on each jewel, meaning James has to file the impulse faces of each pallet to the correct angle – a time-consuming process. Once he’s happy with the overall finish, James oxidises each piece to bring out the details and add some patina. This involves using pumice powder to remove any oils and leave the surface of the silver clean and even. It’s essentially a very fine abrasive, and gives each of the silver pieces a matte look. Once I’m happy with the colour I use pumice one last time to reveal the silver on all the flat surfaces, and use a barrelling machine to burnish them and bring out a shine. I use this method over the more traditional polishing mops because it gives the silver a level of lustre without removing any of the surface layer, and thus affecting the colour I’ve just worked so hard to achieve! The result is remarkable – a truly handmade piece of horological art. I’ve been wearing mine to various watch-related events and meetings, and it never fails to get a comment. There’s something incredible geeky about it, but at the same time, it’s a beautiful thing. It also (slightly) resembles a Klingon Bird of Prey, so gets extra points for sitting on the intersection of horology and Star Trek. James is coming to the end of his degree (the Graduate Show is running between June 15-18 at the School of Jewellery in Birmingham) and I’m looking forward to seeing his dissertation piece – a table clock with a sixty-second flying tourbillon and moon phase indicator – as well as other students’ work. It’s great to see that so much is coming out of this, the first (and only) Horology course in the UK. James’ solid sterling silver lapel pin can be purchased here for £40, including postage and packaging. You can just reply to this email with your answers and images. If you’re not interested, no worries. P.S. I know the questions are tough, but the more specific you can be the better! 1. What watches do you currently own? 2. Currently, what is your favorite watch that you own and why? 3. What is your grail watch and why? 5. What is the URL of your watch website, when did you start it, and how do you plan on making it stand out? Rob – sorry, this comment ended up in my Spam folder. Feel free to email me via the ‘site or just contact James direct. I’m sure he’ll be happy to answer your questions.